While I’m reading a book I like to make notes to reference to as I write reviews. This was not the case for Wintersong, though. Why? I was far too busy devouring every page of Wintersong to bother stopping to write notes. This book destroyed me in the best possible way. I am ruined after reading Wintersong. My review is purely based off of all the emotions this book caused. I have no interest in picking up another book for awhile because I don’t think they will compare until Wintersong fades, just a little bit. Many people love a plot driven story and epic world-building in the books they read. For me, it’s the characters. The characters (both individually as well as the dynamics between them all) are what I focus on. That’s probably why I love Maas’s and Bardugo’s books so much. They, too, have some of the best characters. S. Jae Jones wrote two of the most wonderful characters. Elizabeth and The Goblin King are marked upon me forever. Just the way Katniss and Peeta are. 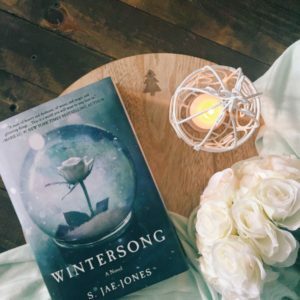 Wintersong was a beautiful book both in its writing and the love displayed. The romance between Elizabeth and The Goblin King made me choke up. There was also a great love for music in this book and the feelings, the agony, the love, hope,and desperation, it brought forth in Elizabeth and The Goblin King left me without words. I had to take frequent stops from reading this book because it overwhelmed me. I already feel myself obsessing over Wintersong. In fact, I have a tattoo sketched up that was inspired by Elizabeth and The Goblin King. Wintersong will slowly fade since I have until 2018 until the next book, but it will never leave me. I will forever recommend this book. I love this review. It sounds like the book really moved you. I’ve had this on my TBR but I may need to move it up a little bit closer to the top.